Merlot Redbud (Cercis × ‘Merlot’ PP22297) Photo by J. Frank Schmidt & Son Co. Approximately 80 percent of the population of the United States now lives in urban environments where trees are both beloved — and imperiled. Estimates are that urban environments are home to 77 percent of invasive species introduced for horticulture and 13 percent for forestry. Espresso™ Kentucky coffee tree (Gymnocladus dioicus ‘Espresso-JFS’). Photo by J. Frank Schmidt & Son Co. Species such as Callery pear (Pyrus calleryana) and Norway maple (Acer platanoides) were first planted in North America in 1700 and until recently they were one of the most widely planted maple varieties on urban streets on the East Coast. Now, Norway maple is on invasive species lists for some states and banned in others. Whether it’s such problems as non-native species, compacted soils, Dutch elm and other diseases, pests such as emerald ash borer or even climate change, many cities are turning toward diversifying tree lists to maintain the known social, health, ecological and economic benefits of urban forests. In so doing, increasingly, cultivars of lesser-known native North American trees are being considered. Making preferred tree lists of many cities for their strong adaptability and newfound predictability of performance are Carpinus caroliniana (American hornbeam or musclewood), Nyssa sylvatica (black gum), Cercis canadensis (Eastern redbud) and Ostrya virginiana (American hophornbeam). This upturn in nurseries selecting lesser-known native North American trees has roots going back as far as 1999, when former U.S. President Bill Clinton signed an executive order directing agencies to address the spread of invasive species. Soon after, Keith Warren, the now-retired director of product development of J. Frank Schmidt & Son Co. (Boring, Oregon) who still works part-time at the nursery and as a consultant, was invited to join an American Nursery and Landscape Association (ANLA) task force to formulate a policy position and recommendations for action. Warren and other growers started putting more emphasis on developing the lesser-known species of native North American trees. These new cultivars are sometimes dubbed “nativars” for their mixed heritage — they are natives with characteristics that meet the demand of the market for uniformity and reliability of performance that cultivars offer. That boom is echoed by Mark Krautmann, owner of Heritage Seedlings and Liners (Salem, Oregon), where revenue from native plants and wildflower seed has doubled at an average of 10 percent annual growth in the last seven years. As a testament to that market strength when the last recession hit, woody non-native tree liner sales dropped 40 percent for Heritage, but native tree sales dropped only 15 percent. Native trees capture carbon and water runoff, and offer food sources for bees, butterflies and native songbirds. Usually, Krautmann said, native insect larvae eat small amounts of leaves, countering the “But I don’t want insects to eat my leaves” argument. Introduced pest species will eat the tree leaves more than the native insects these trees support, he said. Growers like Keith Warren and Michael Yanny, owner of JN Plant Selections and senior horticulturalist at Johnson’s Nursery (Menomonee Falls, Wisconsin), started early experimenting with C. caroliniana, working diligently to turn these natives with so much variation into ones with consistent characteristics. Carlos Oliveira, general manager at Blue Heron Farms (Corvallis, Oregon), points to another Yanny seed selection, Fire King™ Musclewood (Carpinus caroliniana ‘J.N. Select A’ PPAF) as a standout, especially for its vigorous growth. Oliveira also recommends Firespire musclewood (Carpinus caroliniana ‘J.N. Upright’) for its more narrow compact form, as it reaches only 20 feet tall and 10 feet wide while maintaining the same orange-red fall color that makes both standout trees. (Left) Native Flame hornbeam (Carpinus caroliniana ‘JFS-KW6’) tree and (right) its bright leaves. Photo by J. Frank Schmidt & Son Co.
Jim Barborinas, ISA certified arborist and wholesale nursery owner of Urban Forest Nursery (Mt. 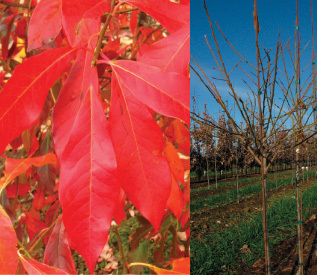 Vernon, Washington), expects more good C. caroliniana to be discovered because of its strong showing in development, with great color and uniformity, including Ball O’ Fire™ and Native Flame (Carpinus caroliniana ‘JFS-KW6’) for their good fall color and Palisade® for its narrow structure. “Given their very tough nature, adaptability to challenging sites, flexible limbs and resistance to disease and insects, all of them are going to be promising trees,” Barborinas said. Barborinas points to another historic challenge of street tree installations that’s generally considered an asset: fast growth. Native North American tree cultivars are excellent alternatives to these fast-growing, large-maturing trees, and Nyssa cultivars provide very good replacements. “Nyssa have small fruit, no insect problem, awesome fall color and flexible limbs, which is important during production, shipping and while growing in the urban jungle,” Barborinas said. These new cultivars are strikingly different from the Nyssa sylvatica species, the ones only available 20 years ago, when planting the straight Nyssa species in numbers was done at great aesthetic risk. Landscapers requesting 60 to 80 trees for a single job could expect many shapes and forms once the trees matured. “If we planted 100 of the straight species, we would end up with a mix of straight or crooked stems, dense or lite forms, uprights, weepers and some that looked like none of the others,” Barborinas said. Not so with the newer Nyssa cultivars. N. sylvatica ‘Wildfire’ is adapted to a wide range of growing conditions, from USDA Plant Hardiness Zone 5 to 9, and laden with bursts of shiny, orange-red foliage in spring. N. sylvatica ‘Tupelo Tower’ is even hardier, to Zone 4, and maintains a striking, columnar form. 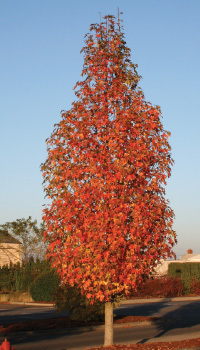 The superior pyramidal form of N. sylvatica Green Gable™ ‘NSUHH’ distinguishes this nativar with its green leaves in summer and brilliant orange and red showing in fall. 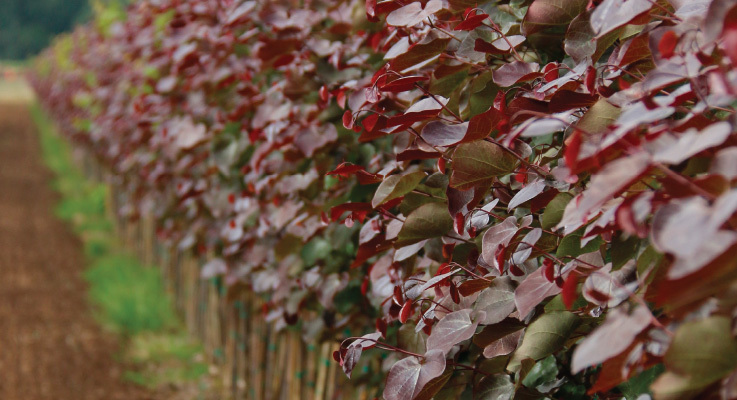 “This selection offers growers predictable growth habit for a uniform crop and predictable performance for architects and gardeners,” Krautmann said. Nyssa sylvatica ‘David Odom’ Afterburner® Tupelo. Photo by J. Frank Schmidt & Son Co.
N. sylvatica ‘David Odom’ Afterburner® Tupelo was introduced by J. Frank Schmidt & Son Co.
Over the past five years, sales at Heritage have bumped up from 12 to 14 percent annually in native trees such as black gum, and redbuds are even more popular. “Demand is especially great for grafted liners in the 4- to 6-foot sizes to bump into #5 to #7 pots for sale year-round. Others may choose the pot-in-pot option to hold them for larger street trees or landscape specimens,” Krautmann said. Oliveira recommends C. canadensis f. alba ‘Royal White’, which at 20 to 30 feet high and 15 to 25 feet wide is the more compact of the species and hardier. It’s covered in small white flowers in spring, followed by the emergence of bronze, heart-shaped leaves that turn to green. He also recommended the new Merlot Redbud (Cercis × ‘Merlot’ PP22297), a cross between C. canadensis ‘Forest Pansy’ and C. canadensis var. texensis, that has the same color of ‘Forest Pansy’ but keeps its purple foliage throughout the summer and can withstand heat and drought. Cercis canadensis ‘Pink Pom Poms’ PPAF. Photo by J. Frank Schmidt & Son Co. According to Krautmann, C. canadensis ‘Pink Pom Poms’ PPAF from Dennis Werner at North Carolina State University has seedless double flowers on two-year-old stems. It’s so new that hardiness is not yet final, but tests at this point show down to Zone 6(b). 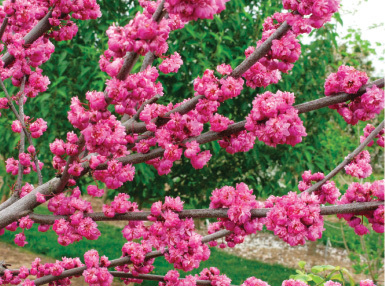 Then there’s Black Pearl™ redbud, with lavender flowers that are followed by much darker foliage than the long-sold ‘Forest Pansy’,” Krautmann said. Closer node spacing means it grows as a shorter, more densely branched small tree, reaching 20 feet tall by 25 wide, and it is drought tolerant once established. The downside of these native cultivars, the growers said, is they are slower-growing, taking one to three years longer than Acer or Fraxinus to get to marketable size. Barborinas suggested maybe 20 to 30 percent more time is needed. “However, knowledgeable arborists and decision-makers are more than willing to pay that for less problems in the long term,” Barborinas said. Oliveira believes there is a longer learning curve as growers figure whether to grow them in grow bags or containers, for instance, moving away from the standard bareroot. “It has to be in a consistent and successful manner; that’s what we want,” Oliveira said. It requires partnerships with customers and growers to get to the best products. Liquidambar styraciflua ‘Clydesform’ Emerald Sentinel® sweetgum. Photo by J. Frank Schmidt & Son Co.
• Liquidambar styraciflua ‘Slender Silhouette’, has a lot of architectural/landscaping interest with a very tight column, reaching 60 feet tall and only 7 feet wide. 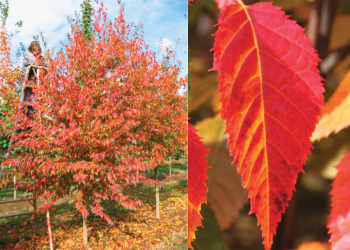 • Liquidambar styraciflua ‘Clydesform’ Emerald Sentinel® sweetgum, introduced by J. Frank Schmidt & Son Co., has compact, slowing-growing habit, tight pyramidal form and shorter stature to 30 feet high and 12 foot wide. • Autumn Treasure® hophornbeam (Ostrya virginiana ‘JFS-KW5’), introduced by J. Frank Schmidt & Son Co. has tight pyramidal form at 40 feet by 20 feet, good branch structure, nice yellow fall color and clean defoliation. • Lindsey’s Skyward™ bald cypress (Taxodium distichum ‘Skyward’ PP22812), is a dwarf deciduous conifer that is also a narrow 6 feet wide with tiers reaching to 20 feet and can tolerate dry and wet conditions. 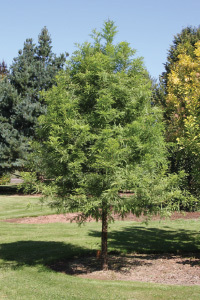 • Green Whisper® Bald Cypress (Taxodium distichum ‘JFS-SGPN’), is a more recent introduction from J. Frank Schmidt & Son Co. with lush, fluffy lettuce-green foliage in summer and rusty orange in fall on a pyramidal 55 foot with 30 foot spread. • Greenfeather® pond cypress (Taxodium ascendens ‘Carolyn Malone’) with greater heat adaptability. • Debonair pond cypress (Taxodium ascendens ‘Morris’ Debonair® PPAF), is a deciduous conifer that is in demand and fits the urban landscape because it’s tough, withstanding drought, wind and hot weather. Green Whisper® Bald Cypress (Taxodium distichum ‘JFS-SGPN’). 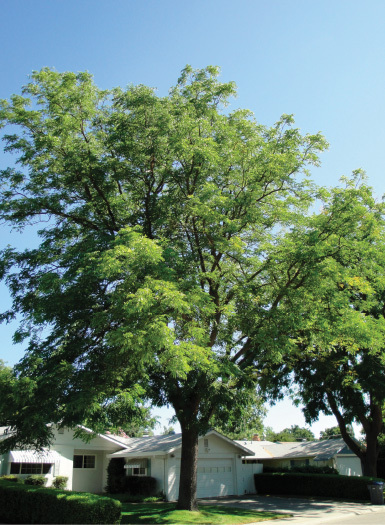 Photo by J. Frank Schmidt & Son Co.
• Espresso™ Kentucky coffee tree (Gymnocladus dioicus ‘Espresso-JFS’), is one of the other bigger trees on this list at 50 feet high and 35 foot spread, so it requires specific citing. As a fast-growing male selection without seeds and tolerant of heat, drought, cold and a wide range of soils, it is an attractive urban selection. Nativars offer an opportunity to employ better native trees in urban landscapes to do what growers have always done: produce the best performing trees. However, change should be made appropriately, “Being native is no panacea; it’s just one more feature, a qualifying criteria that people in the industry can add to the benefit mix,” Krautmann said. “They offer an option for people in the trade to talk about a plant that offers something better than a non-native species as an ornamental, as an addition to the landscape,” Krautmann said.